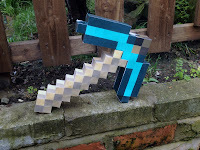 Being a big Minecraft fan myself I really wanted my own life sized diamond pickaxe, and I'm sure I'm not the only one! You could buy a foam life sized pickaxe over at Jinx, but if you haven't got $32 spare then a free papercraft pickaxe printable template is the next best thing. Why spend out and wait for it to be delivered when you can create your own life sized Minecraft diamond pickaxe using papercraft and have it the same day. The Minecraft life sized pickaxe template had to be spread over four sheets of A4, 297x210mm/ 11.7x8.3" printing paper because the template cut out just would not fit on 1 sheet of standard printing card. Click template image to bring up new window then Right click and save all templates. 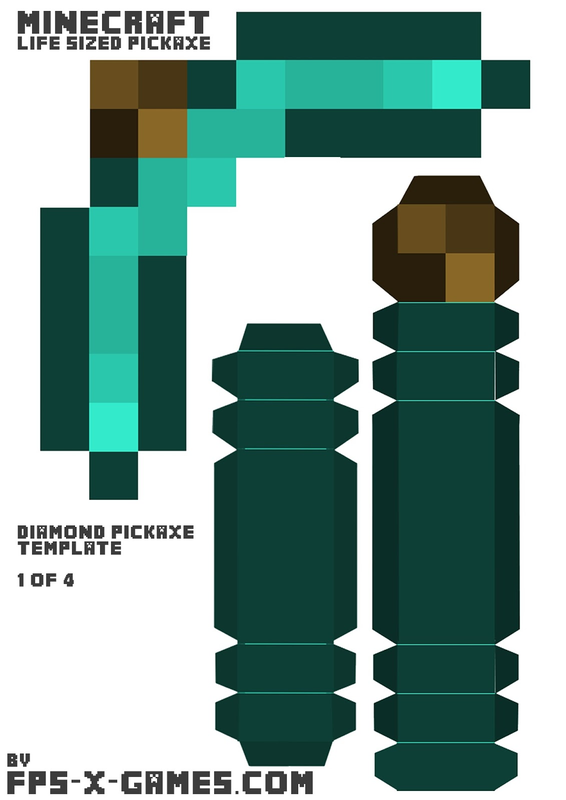 Print out all four life sized diamond pickaxe papercraft templates. Its a good idea to use card when printing, I used A4 160 gsm card for the wood stick to give it a matt finish and inkjet photo paper for the diamond pick head for a glossy finish. 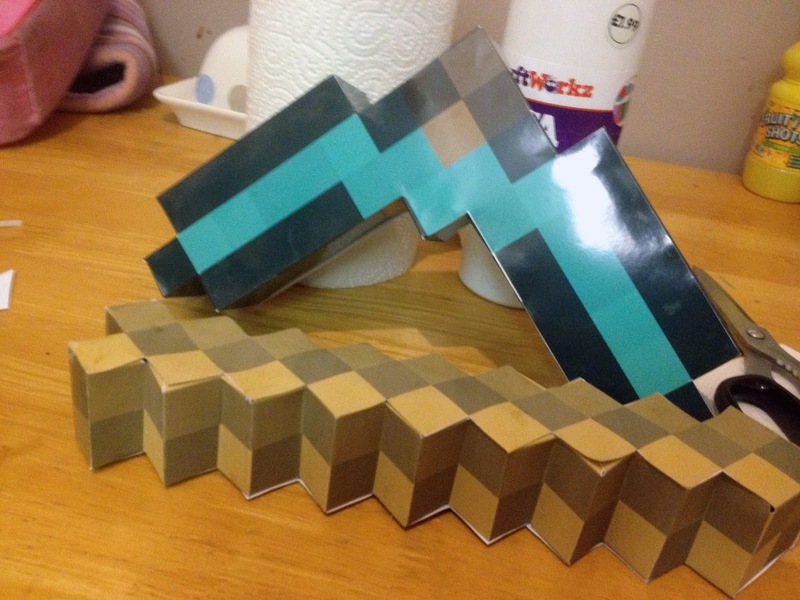 Special thanks to my wife for cutting, folding, gluing and hand modelling. Minecraft life sized pickaxe papercraft template by Steven Bear is licensed under a Creative Commons Attribution-NonCommercial 3.0 Unported License. Way better than the J!NX one :D love it! Good idea anonymous. Will do. Please make a pepakura file for this. Hey, will look into this as I'm experience with 3d models and offer some 3d games content on my website already. Thanks for heads up on this, looks really handy. I recently made 5 of these for my brother and his friends. They love them soo much... And so do I. Thank you so much for the BEST TUTORIAL EVER! 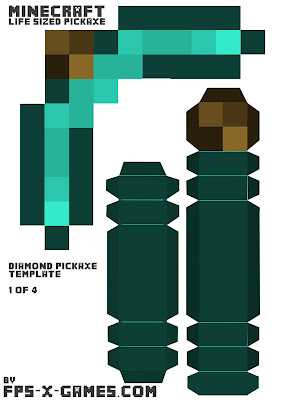 I bought a foam pickaxe off Amazon for my brother and was wondering if I could use this template to make it look diamond. Thanks for the help and the awesome tutorial. Thanks for the great feedback and glad you liked it. If the foam head and template head are same size then should be no problem. 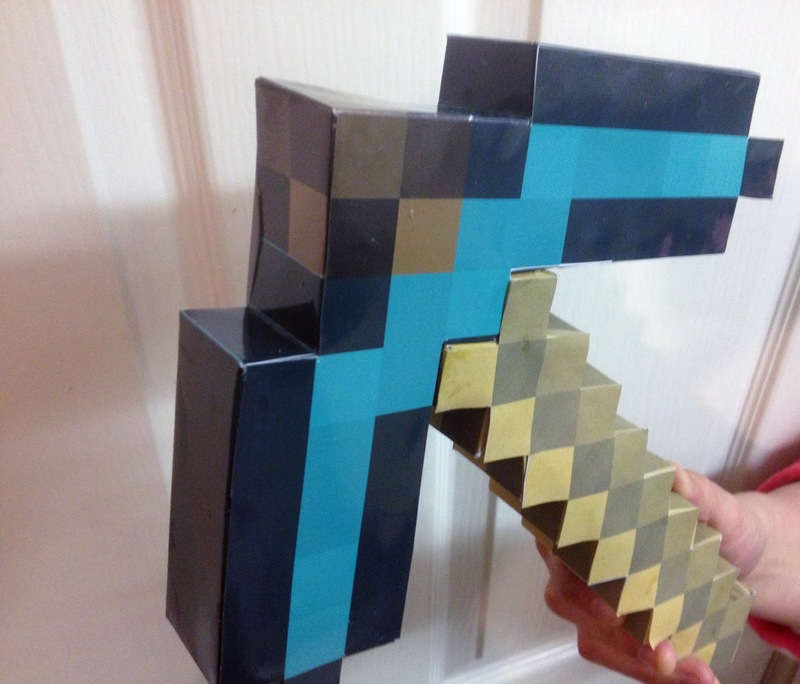 Hey Steve Can you do a sword too? That would be awesome! 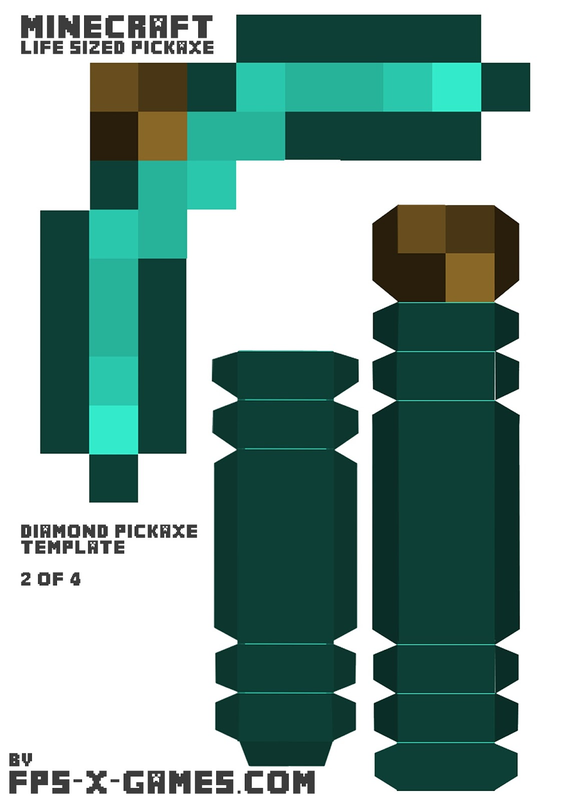 Yep no problem, I did plan to do all the tools with all the different ores. Gonna get motivated and crack on very soon. I trying to get a YouTube tutorial together witch should help a little more. BTW what are you stuck on? Im stuck on the stick. 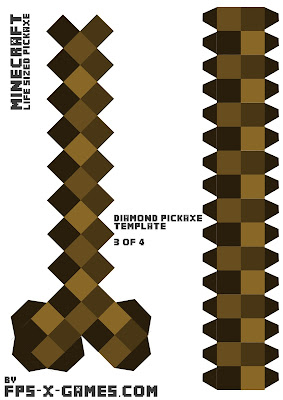 The stick has 5 parts, top, bottom, two sides and a end. Hard to explain with text. 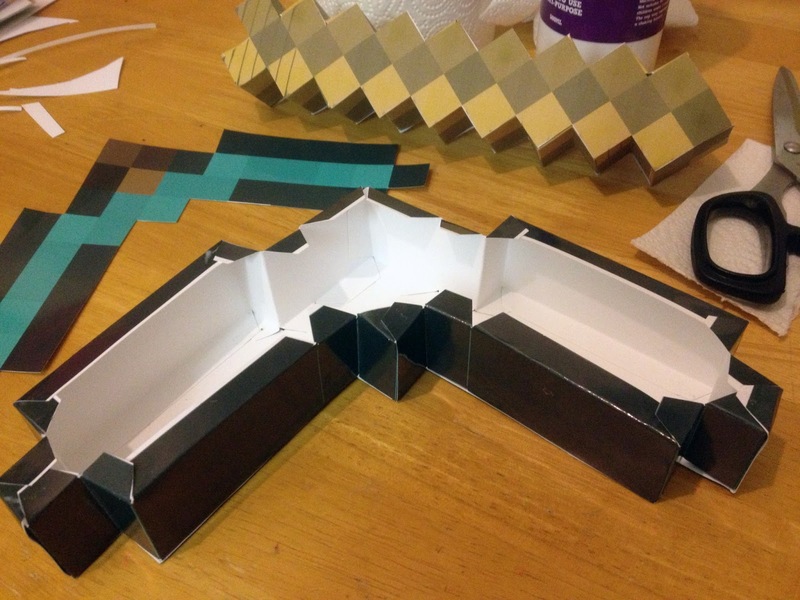 The parts with the coloured tabs are the side parts that should be folded. Sorry but I'll will have to do a YouTube video for this tutorial. Each image file size on the attached templates are only 3.931 X 5.556 inches at 72 pixels/inch. I wanted to have 20 of these printed at my local Office Depot for my son's party this next weekend. But it says the files should be 300 dpi & these are only 72! Do I just use these small files and have them made larger into the 11.7X8.3?? Please help! I'm running low on time & reaaaally want to do this for the boys! Ah think I know whats happened. Be sure to click image to bring it up full size in new window, then right click and save as. This is a good point as I just tested it myself and got same results as you by just saving as. Let me know if it works. how about the size?can use A4 or A3 size? The templates are designed to fit standard A4 printing paper but should still work with A3 printer. Awesome, if you manage to build an epic large A3 version please post on the Internet so I can see it 😊 Maybe on the FPSXGames forums. Thank you for the Youtube tutorial. It was most helpful. I never knew this stuff was so much fun to make. it is great to have all these online and ready to print out. It will make my son's bday so much more fun with all these decorations. thank you FPX-X-GAMES. you really helped me out alot. Hey no problem have a great day. 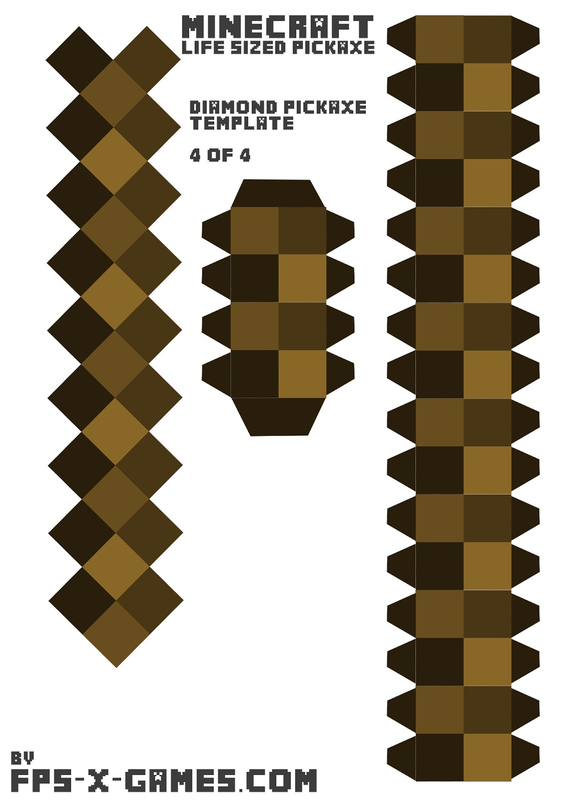 Hey I was wonderin if you could consider making a villager papercraft mask? Great tutorial by the way! Nice. I LOVE minecraft, same with my brother. 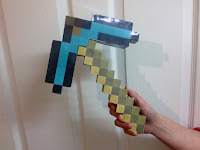 I wanted to get him this foam minecraft pickaxe, but it was $25. Yeah not cheap when you can make one for the cost of ink and paper.